I think I hear sounds of warmer days to come. Branch & Dean, Gwen Sebastian and Eric Paslay all have tempo tunes tailored to spring and summer playlists. So does the Eli Young Band. In fact, the group’s “Dust” is the rockin’ Disc of the Day. And now for something completely — and refreshingly — different. 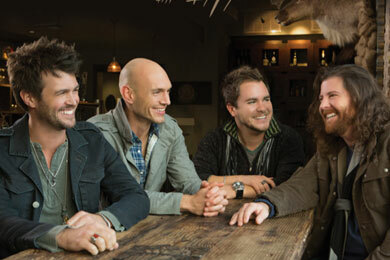 I present for your listening pleasure, Home Free. This week’s DisCovery Award winner is Country’s first a cappella singing group. I think you will find them as delightfully listenable as I did. -What’s the point? Ray’s 1959 original was a perfect country record in every way. All this remake proves is that he was still singing as flawlessly as ever as he aged. Her voice, on the other hand, is utterly superfluous. -I like the moxie in the records that these guys make. While an insistent beat and relentless guitar licks pump beneath their vocals, they praise a babe with a few rough edges and some not-so-prim personality. Totally groovy. -I liked Eric’s stripped-down introduction of this minor-key gem at CRS. And I like this atmospheric-production version even better. He’s on a roll: the boy goes two for two. -The delicate acoustic accompaniment is gently persuasive. Her forcefully direct delivery of the ballad is as sure footed as can be, and remarkably free of the molasses mannerisms of her previous vocal drawl. -Is country music ready for an a cappella group? I sure hope so. These five Minnesota natives won first place on TV’s The Sing Off and are now headed for a radio station near you. This wildly catchy tune (already a hit by Avicii), fabulous harmonies and beatbox propulsion send them on their way in marvelous style. 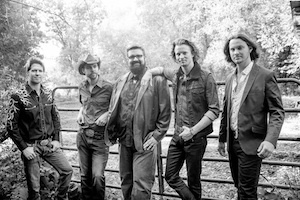 Home Free’s Crazy Life CD also includes an ear-opening rearrangement of “Ring of Fire,” plus a Hunter Hayes medley of “Everybody’s Got Somebody But Me,” “Wanted” and “I Want Crazy.” Essential listening. -He desperately wants to know about his ex, but can’t face the truth if she’s happy without him and has moved on with another. Hence the instruction to lie. The power ballad is very well written, and Tracy remains a terrific communicator in song. Recommended. -McMinn is a Memphis blues performer and Beale Street club owner who dreamed of making a country record. Producer Nix made that dream a reality in 1989. Well, almost. Shunned by Music Row for being too r&b, the tapes were shelved for 25 years. Now dusted off and released at last, they showcase an effortlessly soulful vocalist and a band that knows its way around. -It’s a rocker with a double-time backbeat and some wailin’ guitar work. In the lyric, she’s splitting, hitting the road, turning up the radio, cranking the windows down and leaving nothing but the title substance. Raise your hands, dance around, get dizzy and sing along. -She has a sweetly aching delivery on this languid, torn-between-two-lovers ballad. The piano-dominated production is wonderfully sympathetic, soulful and understated. I was quite charmed by the whole thing.